The Carnival Sunshine sails out of Charleston in 2019. This big ship has an equally large number of fun amenities. Features include an extra-large Serenity Retreat for adults-only. It spans three decks and has a waterfall and plenty of places to relax. Cloud 9 Spa is another super-relaxing spot for adults. The Sunshine isn't all about relaxation. Carnival WaterWorks is the aqua-park that is active fun for the whole family. Waterslides include the Speedway Splash. The SportsSquare has a SkyCourse rope course overhead, jogging track, basketball, and ping-pong. Entertainment options include Playlist Productions musicals, Dive-In outdoor movies by the pool, Hasbro the Game Show, Punchliner Comedy Club, DJ Irie, Havana Bar, RedFrog Rum Pub, BlueIguana Tequila Bar, Piano Bar, and Limelight Lounge. 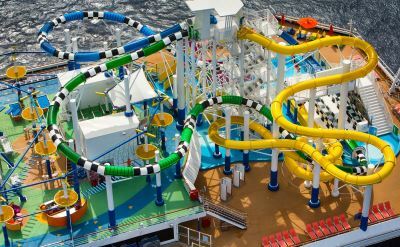 The Carnival Sunshine has plenty of programs and facilties for the young ones. Camp Carnival divides kids into groups of age 2 to 5, 6 to 8, and 9 to 11. Circle C is for ages 12 to 14, and Club O2 for ages 15 to 17. ZSPA is a spa just for teens age 13 to 17. Seuss at Sea brings characters to life for kids of all ages. 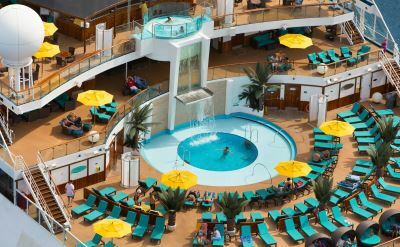 Dining options on the ship include the main dining room, Lido Buffet Restaurant, Guy's Burger Joint, BlueIguana Cantina, Seaday Brunch, 24-hour room service, The Taste Bar, Pizzeria del Capitano, Carnival Deli, Captain's Pasta Bar, and Swirls ice cream. For an added fee you can also try Cucina del Capitano, Bonsai Sushi, Steakhouse Selections, Ji Ji Asian Kitchen, The Chef's Table, and JavaBlue Cafe. Read a Carnival Sunshine cruise review. The above video is a quick (less than 1 minute) introduction to the Carnival Sunshine. 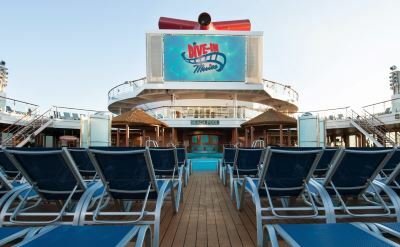 It and the photos are courtesy of Carnival Cruise Line. 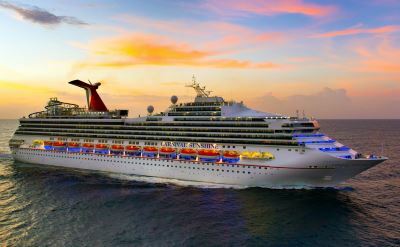 For the complete calendar of departures, please see our Carnival Cruises from Charleston page.